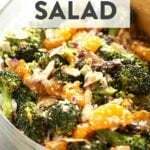 Are you looking for a fun twist on broccoli salad? 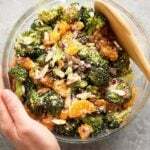 This Vegan Asian Broccoli Salad is the perfect combination of a mandarin orange salad and a classic broccoli salad. The broccoli is perfectly roasted, the dressing is delicious, and it makes for a super healthy meal prep salad for the week! Make it today! The sun is out which means it is officially patio season in Minnesota. It’s over 50ºF which means it is shorts and weather season, people. When it comes to sunshine and nice weather Minnesotans can’t help but be outside. We are all about patio weather and delicious BBQ food. Grilling season is made up of beer, burgers, and midwest salads like this mandarin orange broccoli salad! This is not your average broccoli salad, it’s a delicious, VEGAN broccoli salad. Get pumped. Have you ever made a CREAMY vegan broccoli salad? I didn’t think so! We have a traditional healthy broccoli salad with bacon on the site that is made with greek yogurt and a little mayo, but it is far from a vegan salad! We wanted to create a broccoli salad that was creamy and vegan. We just love our vegan pesto pasta salad and our vegan cheese sauce. We can’t get enough of the creamy cashew sauce and thought it would be perfect in a broccoli salad. Now let’s get down to business. 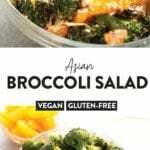 The fixings in this vegan Asian broccoli salad are some of our favorites! This healthy broccoli salad has the perfect combination of sweet and savory and has the perfect amount of crunch! 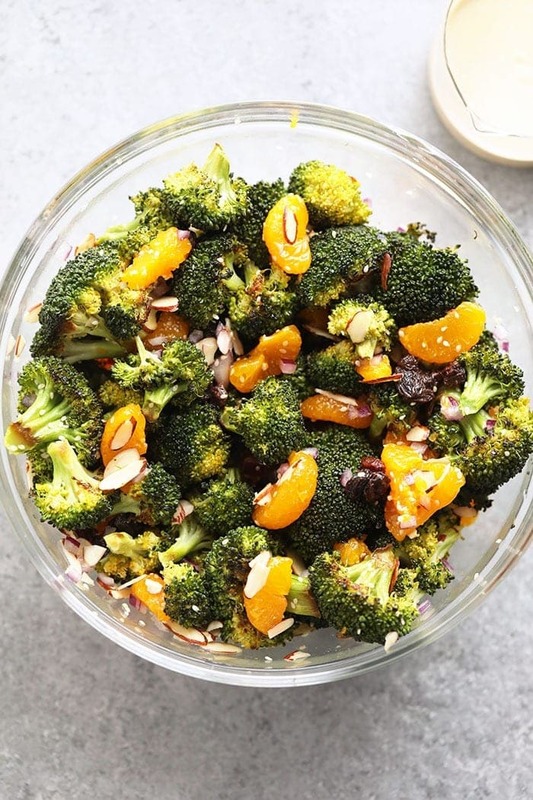 Broccoli- We decided to roast the broccoli for this vegan Asian broccoli salad to give the salad a delicious roasted flavor. It’s so delicious! 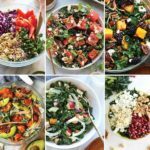 Olive Oil- Olive oil is a great source of healthy fats and it gives any salad a great flavor! 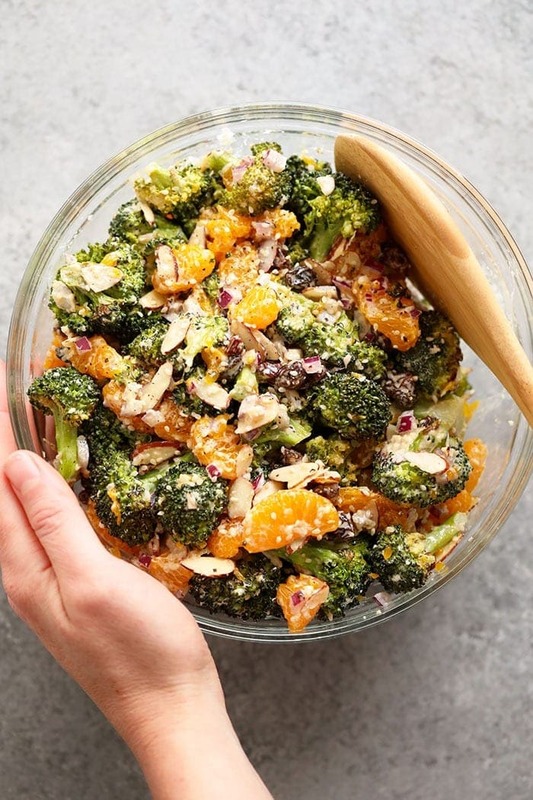 Mandarin Oranges- Not only do mandarin oranges bring me back to childhood, but they are a great sweet addition to this broccoli salad. They give you a little sweetness and vitamin C! Raisins- Raisins keep you regular and are high in healthy sugars to give you a little boost of energy throughout the day. Red Onion- Red onions are nutrient dense! They pack a ton of vitamins are a low carbohydrate vegetable. They give great flavor to any salad. If you don’t like raw red onions, try sauteing the red onion before adding it to the salad. 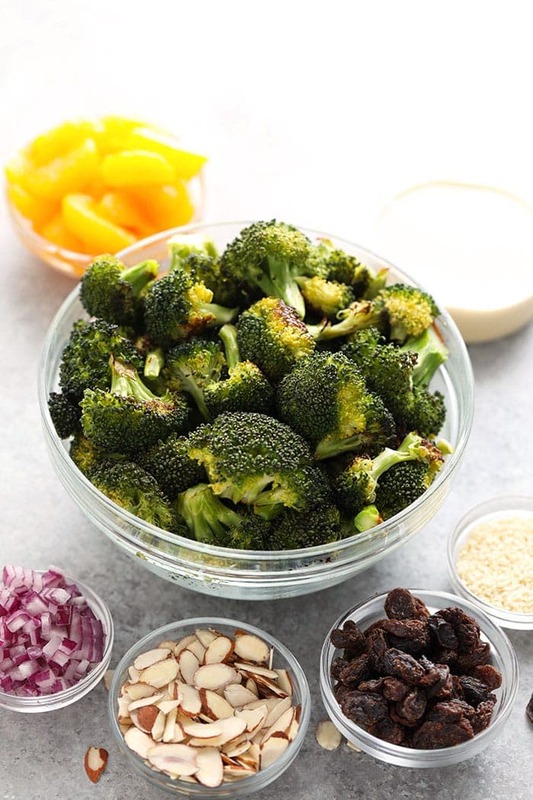 Slivered Almonds- Feel free to choose any nut for this broccoli salad. We chose slivered almonds because they offer a crunch and they are antioxidant rich! Sesame Seeds- Sesame seeds area great source of plant protein and you just can’t beat the soft, yet crunchy texture they offer to any salad. 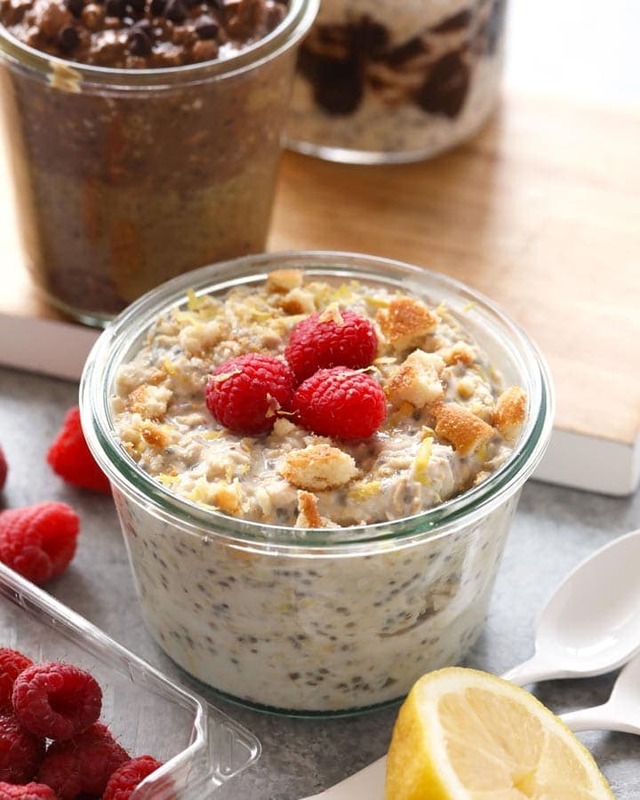 If you are out of sesame seeds, try replacing them with hemp hearts. They offer a similar texture! 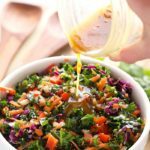 This vegan salad dressing is similar to the dressing we used in our Creamy Vegan Pesto Pasta Salad. You just can’t beat the creaminess that is a cashew cream sauce. I love the amount of protein that is packed into this sauce, especially for people who do follow a vegan lifestyle. Overnight- Cover the cashews with water and let them soak overnight. Flash Soak- Bring a small pot of water to a boil and add the cashews to the boiling water. Let sit for at least 15 minutes before blending. Once the cashews are soft all you have to do is add all of the dressing ingredients into a high-powered blender. This is key! 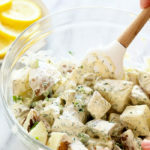 Make sure you have a high-powered blender or a high-powered food processor to pulverize and cream the dressing! That’s it! Pour the creamy cashew dressing over the broccoli salad and you have heaven in a bowl! 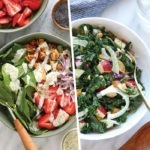 Are you looking for a fun twist on broccoli salad? 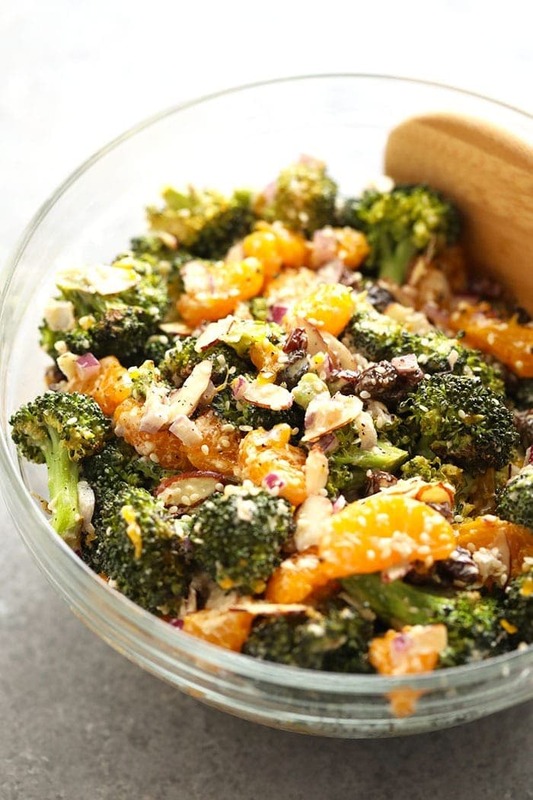 This Asian Broccoli Salad is the perfect combination of a mandarin orange salad and a classic broccoli salad. The broccoli is perfectly roasted, the dressing is delicious, and it makes for a super healthy meal prep salad for the week! Make it today! Spread broccoli florets out on the baking sheet, drizzle with 2 tablespoons of olive oil, and roast in the oven for 20-25 minutes or until broccoli has browned (but not mushy). 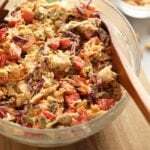 Next, place Mandarin oranges, raisins, red onion, slivered almonds, and sesame seeds into a large bowl and set aside. 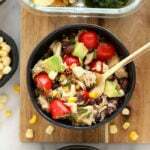 Prepare vegan broccoli salad dressing by placing all dressing ingredients into a high-speed blender and blend all ingredients together until smooth. * Set aside. Remove broccoli from the oven, let it cool, and then add broccoli to the rest of the salad ingredients and mix. 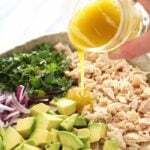 Pour broccoli salad dressing over the broccoli salad and mix well. Make sure all broccoli salad ingredients are coated in dressing. Place in the refrigerator to chill. Enjoy! 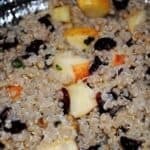 *If dressing is too thick, add water by the tablespoon until it reaches the desired consistency.